Camping Le Lac des Reves is a stunning Siblu Holiday Village that really is perfect for families of all ages. The campsite lies within 33 hectares of pleasantly landscaped grounds and has a real feel of luxury to it with plenty of palm trees and colourful plants and flowers located all around the site. Although the Camping Le Lac des Rives is a large campsite, Siblu have gone all out to ensure there are lots of activities and facilities whilst ensuring that their holiday village is also great for those looking for peace and relaxation. Lattes is located just to the south of the stunning Montpellier and Camping Le Lac des Reves is sited in an area of outstanding natural beauty near to the Camargue nature reserve. This fantastic campsite benefits from stunning views overlooking the Lac de Perol, which as well as being beautiful, is home to a number of different birds including a flock of flamingoes. If you’re looking for a campsite in the south of France, near to the sea then you won’t be disappointed with a stay at Camping Le Lac des Reves. The nearest beach to the campsite is at Carnon-Plage a little over 6km away to the south. Here you’ll find a glorious beach which is covered in soft golden sand that stretches out for miles. The beach slopes gently into the warm Mediterranean sea and there’s plenty of space where you can relax, sunbathe, swim and have fun. At the heart of Camping Le Lac des Reves lies its excellent swimming pool complex that boasts everything you’d need and also expect from a campsite of this quality. In the aquatic area you’ll find 2 large heated swimming pools, a luxurious jacuzzi, a children’s fun pool and of course something that every pool complex needs, some water slides. 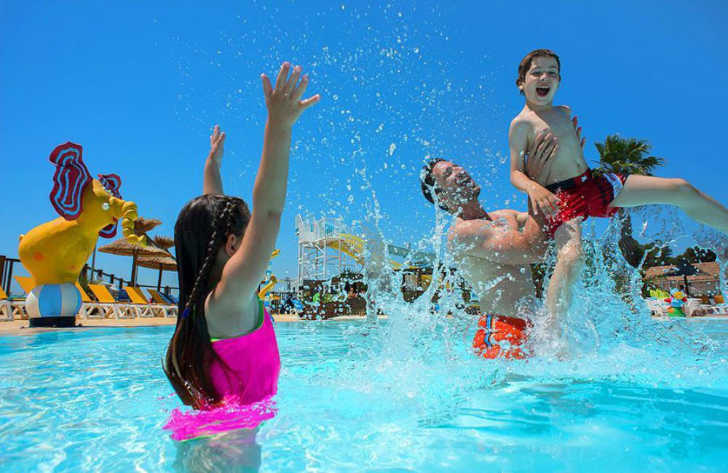 Camping Le Lac des Reves campsite is a brilliant family friendly campsite which benefits from some great activities and facilities both nearby and also on site. On site activities at Camping Le Lac des Reves campsite include multi sports area, football, basketball, volleyball, tennis, archery, table tennis, boules, cycle hire and a playground. Facilities available at Camping Le Lac des Reves campsite include WIFI, restaurant, snack bar, takeaway, bar, groceries, animation team, games room, tv room, washers and dryers. Accommodation at Camping Le Lac des Reves campsite includes a range of 2 and 3 bedroom mobile homes that are available from Siblu and Suncamp.